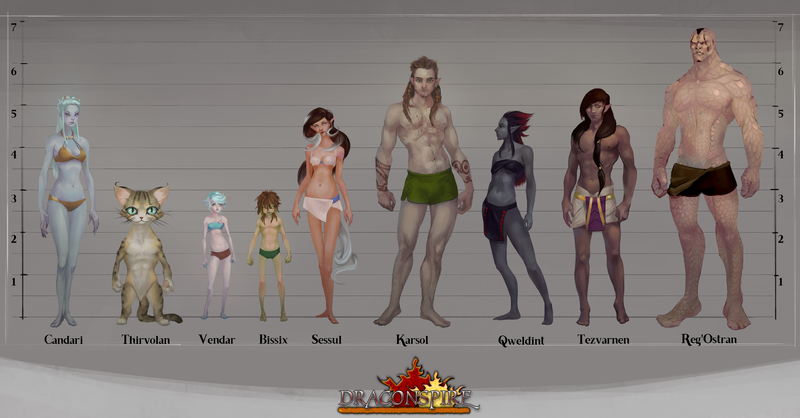 *Half Elf weight, height, adult and max age should fall somewhere between the original elf race and the father race. Half Elves cannot reproduce. Human: Refer to Pathfinder core rulebook for racial traits. Humans are by far the most widespread civilization in all of Draconspire. They follow the racial guidelines stated in the Pathfinder core rulebook. Humans differ little from country to country. Residents of Castros tend to be light skinned with brown, black and red hair, with all shades of eye color. Residents of Pax Thallos tend to have olive to black skin, dark curly hair and dark eyes. Residents of Xar Zanth tend to have pale skin, blonde or red hair and blue, grey, green or brown eyes. Residents of Tirmordane tend to be tan with blonde or brown hair, light and dark eyes are also common. Mountain Dwarf: Refer to the Pathfinder core rulebook for racial traits. Mountain Dwarves have the same racial traits as Dwarves in the core rulebook. There are four major Mountain Dwarf regions on the continent of Tharstelding. The Heman Dal mountains, The Spine, The Calemil Mountains and the Thunderpeaks. Dwarves of the Thunderpeak Mountains tend to be more fair of hair, eyes and skin than the Mountain Dwarves of the other regions. Dwarves from the Heman Dal which is Dwarven for Trial Mountains tend to be darker of complexion and hair. Hill Dwarf: A Hill Dwarf is a Gnome, refer to the core rulebook for racial traits. Replace the Gnome language with Dwarven. Hill Dwarves are close relative to Mountain Dwarves, the largest Hill Dwarf population is in the Golden Hills, which the Hill Dwarves call Rombfissle (Hillhome). Elves: Elves are unique in Draconspire. Being the first race designed by the Shattered Pantheon the Many gave them the raw essence of adaptation. All Half Elves come from elven mothers, elven males are not capable of breeding with other races. Where an elf is born also has a lot to do with the elf’s abilities and natural inclinations. Upon birth an elf takes on specific traits directly linked to the terrain where it is born while discarding other traits, this is known as bonding. Wood elves, called Fendus, from the Greatland Forest are by far the most common elves in Draconspire. Entire civilizations of "bonded" elves exist in Draconspire, but they are usually small, scattered, and hidden from outsiders. All elves share a common tongue with the exception of Vendar who have an additional underwater dialect and Qweldint that have developed an original language. Fendus: Refer to the Pathfinder core rule book information regarding elves. These elves have developed a bond with the woodlands and are the most common elves of Draconspire. Vendar: A Vendar is an elf born in water, commonly called an aquatic elf. Tezvarnen: A Tezvarnen is an elf born in the desert, commonly called a desert elf. Bissix: A Bissix is an elf born in the swap or marshlands, commonly called a swamp elf. Sessul: A Sessul is an elf born in the rolling plains or high table lands, commonly called a plains elf. Karsol: A Karsol is an elf born in high mountain ranges or foothills, commonly called a mountain elf. Qweldint: A Qweldint is an elf born underground or in absolute darkness, commonly called a shadow elf. Candari: The Candari are a mysterious race from the continent of Dayrmacia. They are often confused for humans but have distinct physical features obvious to those that closely examine them. Masters of the five senses Candari can blend in well with most adventuring parties. Reg’ostran: Reg’ostrans are a tall and powerfully built reptilian race. Originally from the sunken continent of Kal, most surviving Reg’ostrans migrated to Tharstelding and Dayrmacia shortly after the destruction of their ancient homeland. Thirvolan: Thirvolans are a small catlike race originally from the sunken continent of Kal. Now they can be found traveling the lands of Tharstelding, or floating atop the oceans in their vibrant cities of lashed together boat homes, platforms and walkways. Often called the gypsies of the sea this wandering race comes across as jovial and content to exist wherever they happen to land.